Back when dry cereal was considered the hallmark of breakfast, the category looked pretty boring. Sales at General Mills, Kellogg and Post would attest to that. Mix in a newfound interest in fuel for the new day and a heaping helping of protein and suddenly the morning daypart has again become “the most important meal of the day.” The momentum is so powerful it’s even lifting the otherwise flat frozen food category. Entrees, sandwiches and bowls are the new breakfasts of champions, or champions of breakfast, especially in the frozen category, where they have dethroned waffles and pancakes. Hot but handheld and portable are the watchwords in this suddenly thriving category. “Echoing an evolving consumer lifestyle trend, portability is shaping breakfast food usage growth, with foods such as breakfast bars, breakfast sandwiches, supplements and energy bars driving usage uptake during 2006-2015,” says a mid-2016 report from Packaged Facts (www.packagedfacts.com). The breakfast category’s growth spurt has caused some acquisition activity in the past couple of years. Breakfast bowls and burritos were among the high-potential products that emboldened Bob Evans to spin off its breakfast-heavy restaurant chain to con-centrate on its food manufacturing under the name BEF Foods … which only a few months later (September 2017) was bought in its entirety by Post Holdings. Conagra bought Odom’s Tennessee Pride, a breakfast sausage maker that was just starting to penetrate the refrigerated breakfast sandwich niche. Likewise for Jimmy Dean, which was bought long ago by Sara Lee, folded into Hillshire Brands and then acquired by Tyson. Kraft Foods (now Mondelez) was having such success in Europe with breakfast “biscuits” that it created the category in the U.S. when it brought its BelVita brand over the pond. PepsiCo’s Quaker responded with similar Breakfast Flats in four flavors. Not content with hot or cold cereals, Quaker went on to develop many granola bars, pastry-like Breakfast Squares and recently Morning Go Kits – whole grains, fruits and nuts in a clamshell. And it capitalized on something consumers already were doing with Overnight Oats – instead of having to cook oats, consumers can soften them by soaking in milk overnight. Even nostalgic Cream of Wheat, a B&G Foods brand, tried to modernize with To-Go Cups, including licensed flavor Cinnabon. Jimmy Dean was just a maker of breakfast sausages when sold by the country singer/actor to Sara Lee Corp. in 1984. As the new parent firm transitioned to Hillshire Brands, the Jimmy Dean brand explored other break-fast options and found huge success with Stuffed Hash Browns, frittatas, English muffin and croissant breakfast sandwiches, bowls and Simple Scrambles in microwavable cups. The breakfast category’s potential has drawn processors that have never been there before. Kraft Heinz via its Ore-Ida brand recently launched Just Crack an Egg, which combines ingredients such as potatoes, ham, cheese, peppers and other vegetables so that consumers can add an egg and make a hot scramble in under two minutes in the microwave. Even McCormick & Co. is testing the waters. Last year, the company used its spices and seasonings know-how to debut the Good Morning line, 18 clean-label prod-ucts, including slow-cooker breakfasts, smoothie flavor-and-nutrition packets, breakfast topper ingredient add-ins and breakfast seasonings, such as apple cinnamon. They’re meant to “boost the flavor and nutrition of breakfast staples and solve the consumer pain points of variety, healthy, convenience,” the company says. Egg McMuffin-inspired breakfast sand-wiches often are created by pork sausage manufacturers who transitioned into further processing. Adding a muffin, egg and other ingredients not only complicates production, it can make supply chain logistics a major headache. also meant involving multiple ingredient suppliers. Add to that finished goods shipments to distributors, retailers and foodservice accounts, and the company was dealing with complexities that hadn’t previously existed. Advanced planning and scheduling soft-ware, forecasting programs and inventory accounting in ERP had to be integrated with real-time data collection of work in progress and other shop floor activity. Successful integration was critical to boosting yields, lowering scrap rates, reducing changeovers and eliminating out-of-stock situations, metrics that had a direct bearing on customer satisfaction. Cereals used to be synonymous with breakfast. The grain used to make them may be puffed, flaked, sheeted or extruded, but perhaps the most interesting process is shredding. After grains of wheat are dehulled and washed, they are softened in a cooker and partially dried before entering mills. In the case of Malt-O-Meal, the rollers in the mill elongate a single grain to several inches in length, then feed them into depositors that race across rails suspended over a con-veyor line, laying down a narrow bead of grain. The process is repeated by a series of depositors, building up the beads into the lattice of wheat fibers familiar to shredded wheat fans. The mass is then cut into bite-sized or bowl-sized pieces before being conveyed into a tunnel oven. 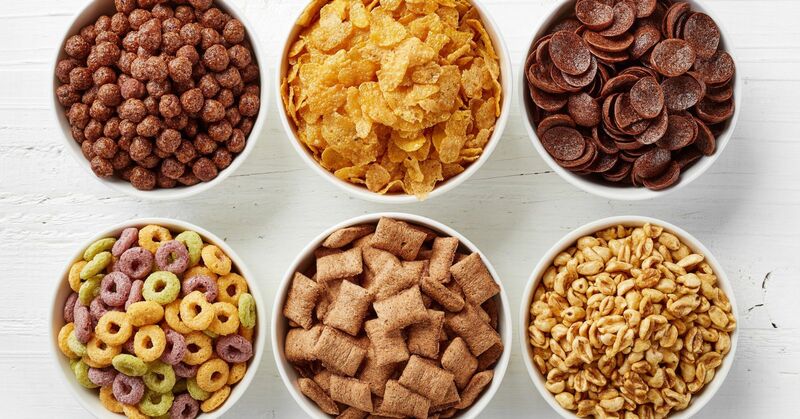 Not only is cereal no longer the traditional breakfast, breakfast itself is under attack from the snacking trend. That shift is evident in all cultures. In Thailand, the norm is seven small meals a day, according to Thammavit Srikrekkrit, vice president of Khao CP Co. Ltd., Thailand’s largest food processor. Rice is an all-occasions dish, he says, and many of the ready-to-eat products the company produces at half a dozen production facilities are consumed morning, noon or night, depending on individual preference. At the company’s Chanburi, Thailand, plant, three highly automated lines churn out more than 200,000 servings of Salabao a day, six days a week. Chunks of dough are automatically loaded into a forming machine, where either minced or barbecued pork is enrobed in dough and transported to a proofer, then to a steamer instead of an oven. From the front of the line to final packaging, the process takes 3 1/2 hours, Srikrekkrit says. Ethnic dishes like Salabao are finding a receptive audience in North America, carving out a niche beside mainstays like eggs. Whether they are producing Salabao or powdered eggs, food processors are improving their processes with equipment upgrades featuring better hygienic design. An example is Nutriom Ova Easy, a fami-ly-owned processor in Lacey, Wash. Better sanitary design might have helped the firm avoid a 2014 recall of its dried egg products for possible salmonella contamination, although product quality was the real driver for a conversion to pneumatic powder transfer. Grinding at the edges of the augurs of screw conveyors were degrading particle size, explains COO Leonardo Etcheto. “There were a lot of moving parts (to the screw conveyors), and that meant there were more things that could go wrong,” says Etcheto. “It was a difficult system to clean and to perform maintenance.” Occasional oil leaks from gearboxes were a contamination source, and plastic components held potential to create shavings that would not be flagged by a metal detector. Nutriom developed a dehydration technology that crystallizes the egg to lock in flavor and negates the need to add preser-vatives or other additives. 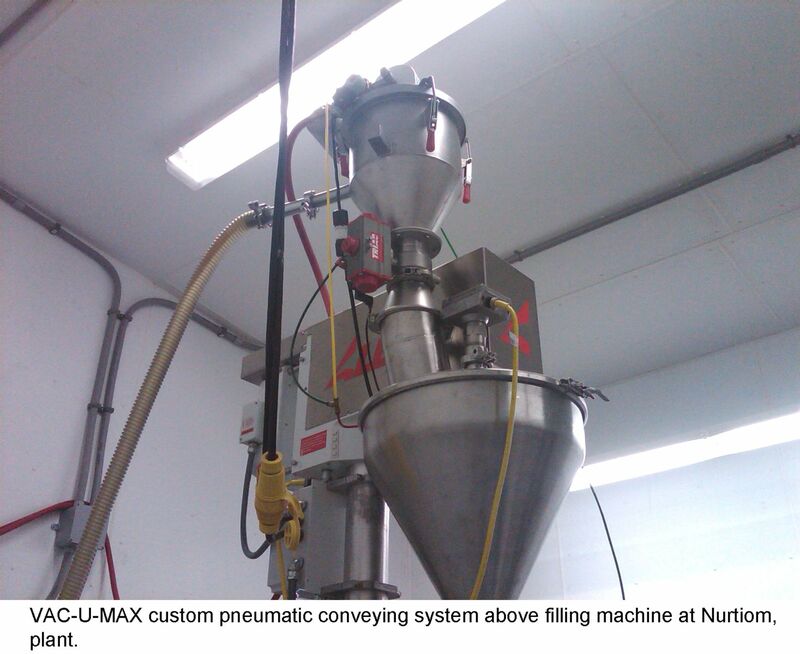 Transferring the shelf-stable crystals from dryers to mixers to packaging presented the potential for contamination, prompting a conversion to pneumatic conveyance in 316 stainless steel tubes. After evaluating several alternatives, Etcheto selected VAC-U-MAX (www.vac-u-max. com) for his first pneumatic conveyor. The Belleville, N.J., vendor has a wealth of breakfast-production background, counting Kellogg and General Mills among its client base, but a more compelling selection reason was its ability to fabricate systems for low-ceiling spaces. When clearance is limited, VAC-U-MAX modifies filter lids to fit the space and uses compressed air to generate vacuum. 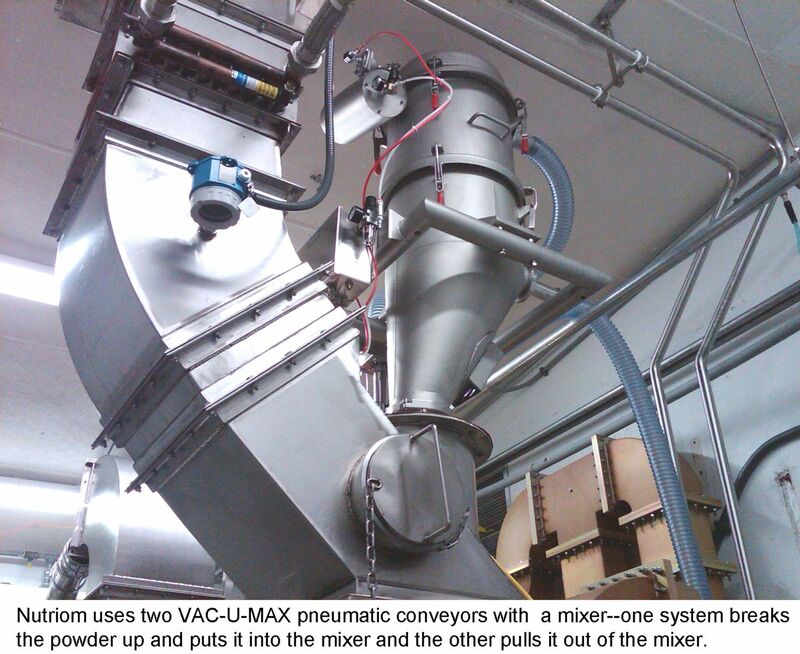 For a 10-ft. vertical transfer point, it used a more efficient vacuum pump. Six pneumatic systems ultimately were installed.